Nelson Irrigation offers a number of different water application solutions for irrigating corn. Pivot and linear systems, permanent and portable Solid Set, and traveler irrigation are all very effective modes of operation. Trust the Rotator® and Big Gun® names for your chosen system type. The center pivot is widely used in corn production and represents a cost-effective, laborsaving solution. When configured with a uniform Rotator® Sprinkler package, the Orange Plate provides the widest throw on drop tubes. Or, if up-top mounting is desired, both the Rotator® and Accelerator offer advantages over spray heads and impact sprinklers. Portable or permanent Solid Set systems are ideal in smaller-sized or unusually shaped fields where it is not practical or possible to use a pivot. 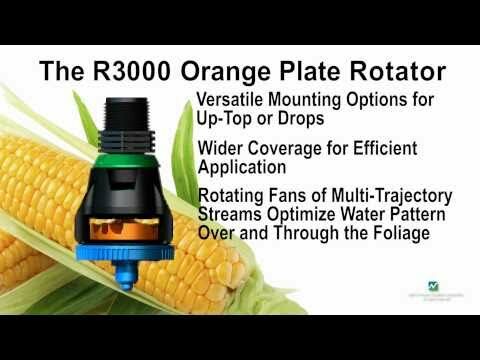 With no vibration, the R2000WF and R33 are the best sprinkler options for the high risers required when corn is grown. Typical spacings for the R2000WF are 30’ x 40’, 40’ x 40’, or 40’ x 50’. Use the Nelson #10352 and #10060-002 PVC fittings for cost-effective riser extensions. Typical spacings for the R33 and R33LP are 40’ x 50’, 50’ x 50’, or 40’ x 60’. Solid Set systems have the potential to match the high uniformity of the pivot option when closer spacings are used in low-wind conditions. Where water volume and pumping capacity are available, Rotator systems are the best option to combat adverse environmental conditions, such as dust blowing at germination time. The Big Gun® Sprinkler on a traveler offers mobility with low labor costs. Travelers can irrigate smaller and rectangular-shaped fields that are not practical to irrigate with a linear system or pivot. Placement and set up of the equipment in the field is for the most part mechanized. These systems are also easily adaptable to incorporate wastewater. They require higher pressure and have little to no filtration expenses. The high trajectory angle and extended mounting height of a Big Gun® on a traveler makes it able to project water over the top of a tall crop, like corn. All of the above system types are enhanced by the use of Nelson Control Valves for proper air and water management.